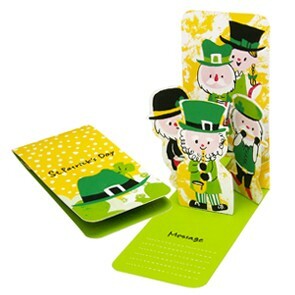 This is a cute Leprechaun band pop-up card to print, cut and fold. 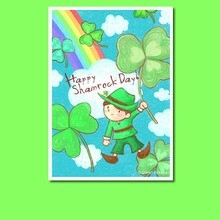 Why not send someone a message for this occasion, with this fun greeting card for St Patrick's day? Print the template you find at the bottom of this page. Cut out all the parts and fold them along the fold lines on each. then sort the bases as well as the front and back covers from the Leprechaun characters. Glue the inside bases together. Assemble Leprechaun character 1 first. Then assemble Leprechaun musicians 2 and 3 in the same way. Attach with glue the 3 Leprechauns to the inside bases and glue the front and back cover. You're done! Just open and close your Leprechaun musicians greeting card with careful precaution to check if the popup mechanism works properly. Wait few minutes for the glue to dry and write your St Paddy's Day message.